As much as we love to go on a road-trip, after three summers in a row, we are forced to cut back this year. For awhile, my salary was in jeopardy (forced cut-backs at my workplace), and then family decided to visit us this year. So we are staying close to home, doing a "stay-cation" in two Phases. We began Phase I just recently. Day One was mostly just visiting with our reunited family -- a pure pleasure for us as newer grandparents. The two daughters and their husbands went off to a baseball game. One of our sons-in-law was able to get four incredible tickets to the Padres game through his workplace. We kept one grandchild and the other grandchild went to his other grandparents for a few hours. What bliss, time to get acquainted with our little one! Definitely, though, check your workplace if looking for discounts on things to do in your area! Day Two started with a family church service for a baby dedication. Then, all 8 of us jumped in two cars (none of us have a van) and drove over to the county fair, AKA "Del Mar Fair". (For years, San Diego County has been trying to get the residents to call it the "San Diego County Fair". It's very difficult to train old dogs to do new tricks, so we still call it the "Del Mar Fair," because it's located by the Del Mar Racetrack.) It takes pluck, determination and patience to go to the Fair on a weekend, but it was our only choice if we wanted to go with all 8 of us (one still has to work). After sitting in traffic burning gas (grrrrr!) for an hour, we finally got parked and walked over to the Fair. We'd picked up a special "Fair Pak" at CostCo, that included 4 admissions, 4 free medium-sized softdrinks, a free coupon book (normally $3), and about 50+ ride tickets. That was a bargain, the Pack cost $60. Just admissions for 4 would have cost $56 (or $52, military price). So, if you have a card to use a membership store such as CostCo or Sam's, check it for ticket bargains. We spent the next 6 hours having fair food (pricey, as you might expect), seeing lots of exhibits, and doing some of the rides. They were typical fair rides -- thrill rides, fun houses, and a special kiddieland. I got my wish, to take my oldest grandchild on her first carousel ride (as my MIL had done for my daughter). She was still too young and small for many of the kiddie rides -- well, maybe another year. I also got to introduce her to my favorite fair treat: cotton candy. Mmmmmm!!!! We walked our feet off, and there were times when I wished I could go and sit with my granddaughter in her stroller! Day Two ended with just adults practically falling asleep over a DVD movie at the house. Upcoming descriptions in this trip report can be referenced in this San Diego area description. Day Three was a "down day"...time spent at home with family. I think all of the adults were still tired from the Fair the day before, and one was so tired he wasn't feeling so well and called in sick to work. Most of us got together in the afternoon and evening for a family barbecue at home. There is definitely something special about "just chillin' " on your vacation! It's easy to take the things closer to home for granted and not fully appreciate them, so it's nice to spend quality time out and about locally. Looking forward to more. Day Four of Phase I, Stay-Cation, was "Old Town San Diego State Historic Park" Day. This is the home of the Wells Fargo Museum. It's a mixture of information about the Wells Fargo company from 160 years, with new information (and an ATM for the bank). This particular state park is located southwest of the Hotel Circle area of San Diego. The park consists of the Presidio (not to be confused with the San Diego Mission), and the historic district. Bordering the area is Fiesta de los Reyes and Bazaar del Mundo. The Presidio is the area with an old church. Old Town SHP consists of museums and shops that are set up in the style of the 1800s San Diego. The neat thing about this place is that there is no admission fee. The only thing you spend is if you purchase something at a shop, choose to eat out, or other. Shops include the candy shop (YUM! ), tobacco shop (somewhere I am thankful that my husband no longer utilizes, since he quit smoking 21 months ago), mercantile, kitchen and quilts, coffee and teas (no Starbucks here, thankfully! ), and more. There is a hotel with its own restaurant and saloon. Then there are museums ranging from the Wells Fargo Museum, San Diego's Mason Street School (the first school, which unfortunately wasn't open today), the horse-buggy-surrey area museum, and more. Fiesta de los Reyes is a small area with a couple of more modern shops plus a great Mexican restaurant, where we had lunch. Since our visitors are from the midwest, where good Mexican restaurants are few and far between, we've tried to have several Mexican feasts -- our daughter misses this style food! There is also Bazaar del Mundo. We didn't venture into that area, nor did we go up to Whaley House (a very commercialized haunted place). Phase I, Day Five, was declared as "Beach Day". Two members of the family had never been in the Pacific Ocean, and we needed some sort of "down day", so we made plans for the Beach. To us, that means a picnic lunch, snacks, drinks, beach blanket, beach towels, swimwear (of course), and to the daughter that lives here, that means beach chairs, umbrellas, and baby gear. Our favorite beach in San Diego is actually located on a military base. When vacationing, we try to utilize military installations if we can, either with their commissary, exchange, recreation, or ticket office. (We've tried a few times to use the Lodge system, but haven't had much luck.) One of the reasons we like this beach is that it's free, it's never busy or crowded, and the parking is easy. The only 2 downsides to the beach is that it's deep -- a long walk from the parking out to the surf -- and since we had 7 people, we had to take two cars that have a military base sticker (which means only ours). Military allows us to take friends and family. Well, we had a great time. Introducing our 16-month-old grandchild to sand and surf was fun. At first, she did not care much for the feel of sand on her feet, but after an hour or so she started to dig and play in it. 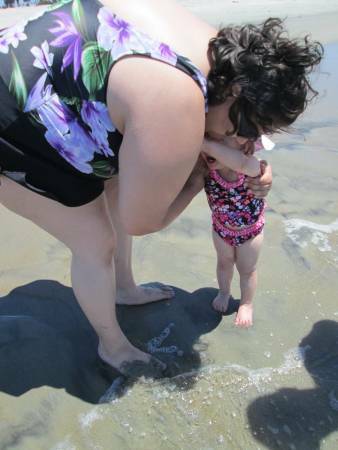 As for the surf, she was really scared of it, and since the water was pretty cold, we didn't push it. Her daddy had more fun with the water, as did her mommy. My husband and I just enjoyed the sun. Once again, we came home before we would get stuck in the traffic. There were two possible places where traffic would get bottle-necked. One was at the base gate, and the other was at the intersection of I-5 north and Rt 163 north. It was busy at both places, but not at a stand-still. Pictures later -- I forgot my camera, but my younger daughter remembered hers! 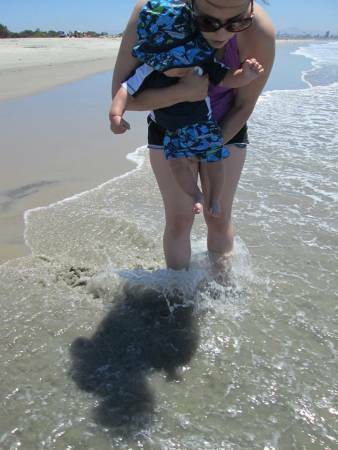 Photos from "Beach Day", when our grandchildren are introduced to the Pacific Ocean for the first time. Day Six was dedicated "Down Day". Three adults had bad sunburn, and two adults had some plans that could not be changed. One daughter and her family went over to the other daughter's house for swimming and dinner. I guess there wasn't much swimming, because of the sunburned dad, but all had a good time. Day Seven was "Day of the Fish": we went to the Birch Aquarium. This Aquarium, located in La Jolla, is part of University of California San Diego (UCSD) Scripps Institute of Oceanography. The Aquarium is only a small part of Scripps Institute. The museum has mostly small fish and ocean creatures; the largest that they have are small sharks and a larger sea bass. If you want to see whales, dolphins, sea lions or seals, you need to go to Sea World (which is about 10 miles down the road, but a whole lot more expensive). Birch charges $17 for an adult to get in, but there are discounts and coupons available if you know where to go. We went in on military tickets at $8 apiece. There is a small cafe, open for late breakfast and lunches, and there are picnic tables outside. We brought a cooler full of bottled water (the only thing allowed in the Aquarium itself) and sandwiches. After our lunch, we went into the Aquarium. We started with the exhibits on the right side, which focus on fish of the ocean. You walk along a hallway with tanks on both sides. Everything is well-signed. Our grandchildren, as young as they are, were very interested in these things. Our granddaughter calls them "bish", which is rather funny. The other outside exhibit was the tidepools. It's very interesting, though there are real tidepools available for crawling around down at Cabrillo. These, at Birch, are easier for the stroller set to enjoy and learn. We went back in to do the hallway exhibits on the other side of the building. Mostly these are diagrams and other exhibits rather than tanks of fish. There were some tanks with coral and its occupants, and several tanks of seahorses and sea dragons. The Aquarium can be seen in about 3 hours unless you read every single sign. Then you'll take another couple of hours. Parking is free, but you do have to walk to the Aquarium from there. In short, we had a lovely time together at the Birch Aquarium! Last edited by DonnaR57; 06-29-2013 at 08:35 AM. Day 8, Phase I, was another "down day". First part of the day was spent taking one member of the family to the airport, as his part of the vacation in San Diego was over. He has to be back to work on Monday morning. Poor guy had a trial getting home. Oh, his plane took off and landed right on time, his luggage made the same flight he did, but unfortunately, his airport pickup (another family member) was a bit late due to a tire blow-out on the way to the airport. But he did get home safely. The rest of the day was rather relaxing! When Tioga Pass will close this year? Day trip close to Atlanta: Suggestions please!